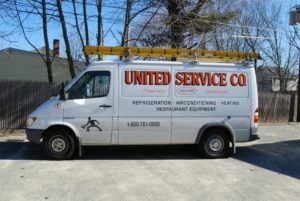 For commercial refrigeration, North Shore residents reach out to the technicians at United Service Co. Since 1953, our family owned and operated business has served businesses and residents in the North Shore area. As a fully licensed and EPA-approved heating, air conditioning, and refrigeration company, we offer our customers a complete array of products and services. Whether you’re updating a restaurant kitchen or opening a new warehouse, our services for commercial refrigeration in North Shore will help you reach your business goals. We know how to keep things hot or keep them cold year after year. Call us today for a service estimate, and we’ll show you why more businesses prefer to work with United Service Co. Whether you rely on walk in or reach-in coolers and freezers, refrigeration plays a crucial role in today’s commercial industry. The ability to precisely control the climate of the space allows you to meet regulatory requirements and preserve foods, medicines, and other temperature-sensitive goods without concern. Commercial refrigeration in North Shore allows businesses to thrive, grow, and meet customer demands. At United Service Co., we take our commitment to refrigerated services seriously. Our team has 100 years of cumulative experience. Time working in the trade gives our technicians a better understanding of both the latest technology and our customers’ requirements. We hold an active, EPA approved refrigerant recovery certification and a Better Business Bureau accreditation to give our customers peace of mind with every service call. When it comes to commercial refrigeration in North Shore, you won’t find a more qualified team of experts to help you with any service request. When we say we’re a complete resource for commercial refrigeration in North Shore, we mean it. Our team can design new cooler and freezer units for any space, build and install units of any size, and service them over a lifetime. We’re available and on call 24/7 so you can protect your goods and avoid serious product losses due to downtime. Call us for preventative maintenance and repair work on coolers, freezers, ice machines, and water chillers. We’ll send a team member out ASAP to inspect the system, provide an estimation, and get to work. We have a reputation for excellence in repairs. With experience working on most modern makes and models, we can source parts and complete repairs fast to keep you up and running. When you think of refrigeration services, don’t trust just any maintenance company. Come to a business that specializes in commercial refrigeration in North Shore. Browse through our customer testimonials. For complete restaurant equipment, HVAC, and refrigeration services, remember the name “United Service Co.” We look forward to showing you what smart refrigeration service can do to lower your operating costs and save you time and money. Keep customers happy and control your inventory better with custom designs, installations, and repair work from us. For more information on commercial refrigeration, North Shore companies can reach out to our office at either (800) 761-0900 or (978) 750-5600.